Last night, Heisman Trophy-winner Johnny Manziel of Texas A&M was at the Mavericks-Heat game in Dallas. And I’m not talking, he was up in the press box doing an interview, or just sitting somewhere in the stands. I’m talking the kid had courtside seats. Surprisingly, the TNT announcers actually brought up an interesting point: how does a 20-year-old college kid get courtside seats to a basketball game featuring LeBron James? I mean, courtside seats to a Heat game are pretty hard to come by. LeBron is, after all, the greatest player of his generation, and it’s not like the kid has a job. Now, obviously you’re saying, “Hey, the kid is just about the most famous person in Texas right now. He just won the Heisman. Obviously someone gave him the ticket.” And that’s exactly the point. When you’re a college athlete, you have to be extremely careful when you accept anything anybody gives you or else you could spark an NCAA investigation. 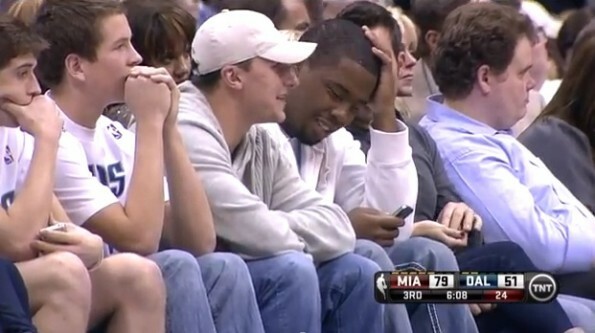 Nevertheless, there was Johnny Football, front and center at the Mavs game. Supposedly, Manziel went just to see LeBron, which is understandable. But what’s surprising is that LeBron said after the game that he was honored. I mean, yes, Manziel had a historic year, but he’s got a long way to go before he can hang his hat with the likes of LeBron in the pantheon of all-time greats. So to have LeBron say something like that is pretty awesome. Of course, as he himself admitted, LeBron didn’t get a chance to go over and say hello at any point, which is a shame. It would have been nice to see him leave one of Manziel’s buddies hanging, too.